The Alwarpet Christmas Street Fest is back this year for Round Two. Shops on the north end of C. P. Ramaswamy Road have once again come together to host this sale – on two Sundays, December 9 and 16. Participating stores will have special offers and/ or limited time discounts on these days. 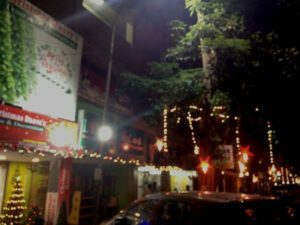 The participating stores are Azurina, Brass Tacks, City Bed Emporium, Gramiyaa, Kimono, Maahikhas, Raave Christmas Store, Samasta, Saanskrutie, Silver Moonlight and Sudi Store. Food and craft vendors will also set up stalls off the pavement. Expect Christmas cookies, ornaments, cakes, chaat, garden accessories, handmade accessories and balloon animals. This entry was posted on Friday, December 7th, 2018 and is filed under Sales, Shopping. You can follow any responses to this entry through the RSS 2.0 feed. You can skip to the end and leave a response. Pinging is currently not allowed.